This new GWAR album's last song Fly Now pays tribute to their former band member, guitarist Flattus Maximus (Cory Smoot) who sadly died in 2011 from a heart failure. GWAR took a hard blow losing Flattus, but from sad events sometimes comes great new stuff. They have managed to rebuild GWAR underneath the Antarctic ice sheet and they are now sounding better on record than ever before. "Fly now Flattus, Flattus be free." In fact I think this is their best musical effort since the album America Must Be Destroyed . Fast judgment perhaps, as I've only had the new album for a day now, but it's been blasted on constant repeat ever since I opened the cd package and I liked it instantly. In fact I can't wait to catch GWAR live again some day and to watch some serious decapitations and mutilations on stage, while enjoying some of the new tunes. Pustulus Maximus is introduced as the new lead guitarist and he certainly fits in well in the GWAR madhouse. GWAR are still further refining their metal sound, a path they have been following for years now. What you'll get here is an awesome and crystal clear production, hammering rhythms and some serious double pedal drumming going on all over the album, cool dynamic riffs and Oderus "sings" better than ever in that special punk rock style of his. This is not an album with sing-along pop-punk tunes, this is hard, fast, loud metal rock that takes no prisoners. Well, GWAR always takes slaves of course, but you know what I mean? 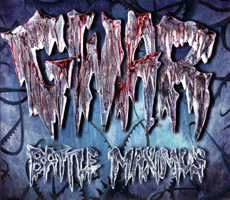 It is no surprise that the lyrics are still far out and insane in the usual GWAR fashion and there's a mini-poster / lyrics sheet included to help you get all the details. A new deadly foe, Mr. Perfect, comes through time to steal GWAR's Jizmoglobin, a blue bodily fluid that is responsible for the creativity, rebellion and decadence of all creatures. If he succeeds GWAR will die. Or something like that. The album holds 12 songs (plus an intro track) and one of them is the really great instrumental title track Battle Maximus with many guest guitarists of the Maximus klan - all paying tribute to their lost friend, Flattus. In the song I, Bonesnapper - GWAR's cave troll pops in his cute green head to complain a bit. "Nobody likes me anyway! It's not easy being green!" On a final note, this review is slightly biased by the fact that Oderus Urungus pressed a sharp blade to my neck while I wrote it, but never mind that. I think it would still have been very positive even without a little guidance from our Lords and Masters. GWAR - Lust In Space ♦ The CroBar - Vol One ♦ GWAR - Bloody Pit Of Horror ♦ GWAR : "The Blood of Gods"